for African elephants, with their saddle-like concave backs and much larger ears, their females carrying tusks like males, their sloping foreheads and corrugated skin, trunk tips ending in a pair of pincer-like lobes? Still, it happens all the time. A website or newspaper reports on a serious issue involving elephants and people in the fragmented landscape of forests and fields and cities in southern India, but uses a photograph of a large herd of African elephants marching through open savanna. A tea producer in Assam brands its tea packet with an image, not of Asian elephants walking old migratory routes where huge tea plantations now exist, but that of a herd of African elephants, adding gratuitous insult: these are ‘raging elephants’. A reputed Indian scientist suggests making fences with disused railway tracks to separate people from elephants here in India because it has worked in Addo National Park in Africa, and the authorities take the suggestion and run to install another barrier in an already sundered landscape. To sell news or products or opinions, the African is pulled in place of the Asian, again and again and again. One baulks at the indifference, at the injustice and ignorance on display. There’s not much to an elephant, really, when you’ve walked round him once, you’ve seen all there is to see. Which means that Elephas maximus Linnaeus, 1758, as the species is named, fully and formally, refers at the first instance to the African elephant. Which means that I might now have to suppress my smug, superior erudition on telling Asian from African elephants and instead eat my own words. Which goes to show that you never know where you will be led when you dig into the past. Into history. It is the idea of history itself, that Saramago examines from his fictional vantage point, using the lens of literature. …but that is how it’s set down in history, as an incontrovertible, documented fact, supported by historians and confirmed by the novelist, who must be forgiven for taking certain liberties with names, not only because it is his right to invent, but also because he had to fill in certain gaps so that the sacred coherence of the story was not lost. It must be said that history is always selective, and discriminatory too, selecting from life only what society deems to be historical and scorning the rest, which is precisely where we might find the true explanation of facts, of things, of wretched reality itself. In truth, I say to you, it is better to be a novelist, a fiction writer, a liar. Perhaps Linnaeus, in his enthusiasm to describe the elephant, paid insufficient attention to history. The elephant foetus that Linnaeus labelled was obtained at his behest by the Swedish royalty from the collection of Albertus Seba, a Dutch pharmacist interested in natural history and trader in animals collected from various parts of the world. 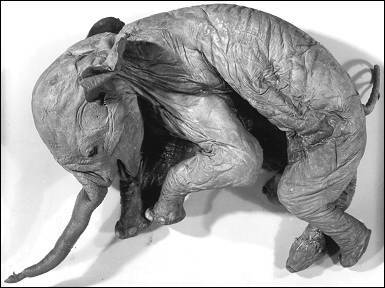 Seba obtained the elephant foetus from the Dutch West India Company, which traded in Africa and regions west across the Atlantic. Linnaeus, however, believed and declared the locality of origin of the elephant as Ceylon (Sri Lanka), which may have been the case if the source had been the Dutch East India Company. If Linnaeus had paid more attention to history, as to biology, one would perhaps have not had to wait 250 years for an analysis of ancient mitochondrial DNA to establish that the elephant originated in a part of Africa where Dutch traders were active in the 17th century. Linnaeus had, unwittingly, been looking Lanka instead of talking Togo. because life laughs at predictions and introduces words where we imagined silences, and sudden returns when we thought we would never see each other again. Where that skeleton came from is another remarkable story. One that takes the tale another hundred years into the past, into the mid 17th century. In 1664, John Ray, an English academic who quit Cambridge to pursue natural history and travel through Europe, saw and wrote about “…the skin and skeleton of an elephant which was shown in Florence some 8 or 10 years ago and died there”, a specimen that Linnaeus, too, was aware of. The skeleton remains today, much as Ray described it, in the Natural History Museum of the University of Florence. The scientists have verified from anatomical and molecular analysis that the skeleton is that of an Asian elephant. I applaud their patience, their achievement, but it is Saramago’s subtle humour that rings in my ear. The skeleton was that of an elephant named Hansken. Hansken was a female Asian elephant, brought to Europe courtesy the right company this time, the Dutch East India Company, from Sri Lanka, with the fortuitous result that the type locality mentioned by Linnaeus for Elephas maximus can now remain the same. Arriving in Europe in the 1630s, she was taken as a travelling curiosity through varies cities, including Amsterdam, where in 1637, she was sketched by a person no less than Rembrandt! This is Hansken. This is Elephas maximus (Sketch by Rembrandt, Courtesy: British Museum via Wikimedia Commons). Now, I cannot help wondering if Rembrandt and Linnaeus were aware of the other elephant that had journeyed from Sri Lanka through Europe, a century earlier in the 1550s: the Suleiman of history, the Solomon of Saramago’s story. (Is history and his story really all that different, for an animal with culture and memory like the elephant, for people like us? In Saramago’s part of the world, in Portuguese and Spanish and Catalan, is not the word for story and history the same? Historia! So it is.). when it chooses, is as good or even better than god at writing straight on crooked lines. Of Solomon, we know that he entered Vienna in early 1552 and died in less than two years. What we know little about is of the people who attended to him, particularly his mahout. Not so, of course, in Saramago’s story, wherein “to fill in certain gaps so that the sacred coherence of the story was not lost”, he invents a mahout with a peculiar eastern Indian sounding name, Subhro. As Solomon enters Austria, Subhro, too, is passed on with the elephant to Maximilian, who with a sort of Germanic disdain, renames the elephant Suleiman and rechristens his mahout, Fritz. What do we know of the life of Subhro-Fritz? Or of Hansken’s mahout? There are inscriptions and woodcuts, coins and frescoes, depicting Solomon in Europe, and Hansken is immortalised by Linnaeus and Rembrandt, but clearly the elephant is the centre of attention, not the mahout on its back. but, one way or another, dear friend, while your future is guaranteed, mine isn’t, I’m a mahout, a parasite, a mere appendage. and that was that, we will not see them in this theatre again, but such is life, the actors appear, then leave the stage, as is only fitting, it’s what usually and always will happen sooner or later, they say their part, then disappear through the door at the back, the one that opens onto the garden. Still, worse things could happen. The foetus could become a museum celebrity, to be probed and pinched and peered at further. It could become a case study: required reading in taxonomic textbooks. For the first time in the history of humanity, an animal was bidding farewell, in the literal sense, to a few human beings, as if he owed them friendship and respect, an idea unconfirmed by the moral precepts in our codes of conduct, but which can perhaps be found inscribed in letters of gold in the fundamental laws of the elephantine race. Callaway, E. 2013. Linnaeus's Asian elephant was wrong species. Medina, R. 2013. Ceci n’est pas un éléphant. Margaret Jull Costa.) Mariner Books. This entry was posted in Asian elephant, people, science and tagged African elephant, art, essay, literature, research, Saramago, wildlife on 14 January 2014 by T R Shankar Raman. What a journey for the unborn!